SOUTH Africa’s ruling African National Congress (ANC) has thrown its weight behind Zimbabwean counterpart, Zanu-PF, and is keen to assist the latter in light of economic challenges and attempts to isolate the country on the international community on the back of pressure by the local opposition and its allies abroad. 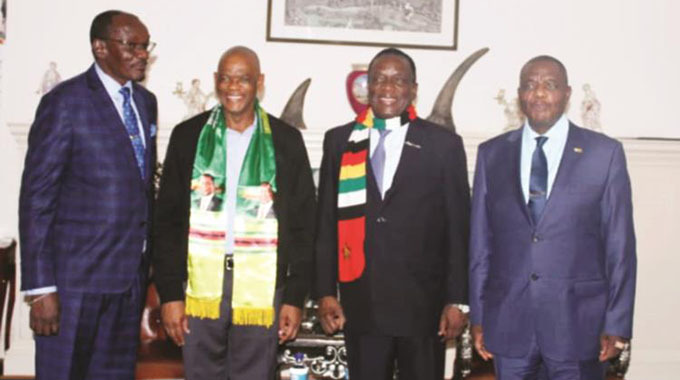 This was revealed by a delegation from the ANC which arrived in the country on Monday to meet with their Zimbabwean counterparts on a solidarity visit. The meeting had the blessings of other regional liberation movements. The team, led by ANC secretary-general Cde Ace Magashule was yesterday morning briefed about the current situation in the country by Zanu-PF secretary for administration Cde Obert Mpofu at the party headquarters. Other senior ANC officials in the delegation are Cdes Tony Yengeni, Thoko Didiza and Bongani Nongo, who are all ANC Central Committee members and Cde Justice Phitso, the chief-of-staff in the secretary-general’s office. “This our solidarity visit to Zanu-PF, to Zimbabweans. We undertake this visit because of the present situation we have observed at a distance. “And as former liberation movements, I think we have agreed that this is the time to consolidate and strengthen our relationship. In fact, before we left we set down with his Excellency our President, Cyril Ramaphosa, and our various committees to understand (our mandate),” he said. “You (Cde Mpofu) have indicated that Zimbabwe is faced with this well calculated, well planned activities of insurrection, of ungovernability. We want to understand so that when we look as to what is the way forward we have comprehended. In a press briefing later in the evening, Zanu-PF spokesperson Cde Simon Khaya Moyo said the two parties agreed that there was no legitimacy issue surrounding the Presidency in Zimbabwe as the country had held peaceful and credible elections last July. “The parties therefore resolved: that the parties acknowledge the peaceful and credible manner in which the July 30, 2018 harmonised elections were conducted and the subsequent deserving endorsement of the election results by the regional and international observer groups including the landmark ruling by the Constitutional Court of Zimbabwe hence there is no legitimacy issue surrounding the Presidency. “That the parties continue working in common purpose towards strengthening their existing excellent relations. That the parties acknowledge that the major challenges confronting Zimbabwe are a result of the illegal sanctions imposed by Britain and her allies over the bilateral dispute between Zimbabwe and the former over the land reform programme. The parties further call upon Sadc and the African Union to advocate for the removal of the sanctions,” Cde Moyo said. While receiving the ANC delegation in the morning, Cde Mpofu said the two parties were joined by a very rich revolutionary background which culminated in their people being emancipated from the tentacles of oppression and subjugation over many years. “Our long walk to freedom as stated by your founding father Cde Nelson Rolihlahla Mandela still continues. As Zimbabwe we have achieved one milestone in this journey of emancipation by ensuring that we take ownership of the land. “This precious resource which is very dear and sentimental to all Africans should not be taken for granted,” he said. Cde Magashule said former liberation movements in the region were aware that ANC and Zanu-PF were meeting yesterday since he had informed them. “And later on as we move forward, we want to move forward as former liberation movements in addressing your situation. So we are here as friends, as brothers and sisters, as mothers and fathers, comrades, former liberation movements and revolutionaries of yesteryear. We still share and the struggle continues,” he said. He said they were going to report back to their country and will return to Zimbabwe at a later stage on the way forward. “I am sure we are here to engage and try to understand the situation. Be as open as possible, be frank with us so that we diagnose the situation correctly. “It’s better to hear from the horse’s mouth and that is why we are here,” Cde Magashule said. Cde Mpofu said Zimbabwe was now in second revolution to achieve economic emancipation and they had deliberately set themselves on a new trajectory to achieve an upper middle income economy by the year 2030. “The journey for this economic thrust is also mired and punctuated by anti-establishment forces which are pervasive and will never rest till they achieve the continued suffering of all our people in Africa and all our marginalised friends who still suffer in perpetuity in Palestine, Venezuela, Cuba and Saharawi. “In our region we are confronted by forces of regime change being peddled by the United States of America and its allies,” Cde Mpofu said. He said as former liberation movements there were under the onslaught from neo-colonialists forces that were financing opposition parties and civil society to foster regime change. “This is being manifested through different forms and shapes like through social media, non-governmental organisations, labour movements to the extent of arming our citizens. “In the same vein some of these establishment forces are starting to sprout in South Africa namely formations like Tajamuka, Africa Democrats and the Communist Party of Zimbabwe all of which are not legally registered political organisations in Zimbabwe and are bent on fomenting violence and acts of terrorism. “We therefore urge comrades, that you cast your cautionary eye on these malcontents bent on the destabilisation of the region,” Cde Mpofu said. He said as Zanu-PF, they were bombarded by a plethora of subversive strategies which include illegal sanctions, insurrection and instigation of citizens to conduct violent protests, wanton destruction of property and ensuring that the country becomes ungovernable. “We have had loss of lives in the recently ended national elections and the MDC-Alliance sponsored mass stay away which took place in the past weeks. We are assured and still have confidence in you the ANC as our former liberation movement sister party in your continued solidarity and moral support to make the international community realise that the illegal sanctions imposed on Zimbabwe are not sustainable and only lead to the suffering of the poorest to the poor,” he said. Cde Mpofu said the ruling party appreciates the efforts of ANC in ensuring that all former liberation movements stay on the path to economic freedom.